Finally after eighteen months or so since Judgment and Wrath graced the shelves of US bookshops, book three in the Joe Hunter thriller series has been published as a mass market paperback. 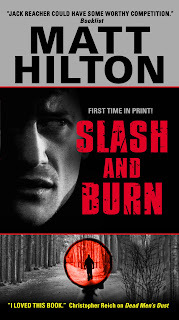 Yes, SLASH and BURN is finally available from William Morrow and Company (Harper Collins) and is earning good reviews. The book has been released in much higher numbers than Joe's previous outings, and I'm hopeful of him winning the audience he deserves across the pond. 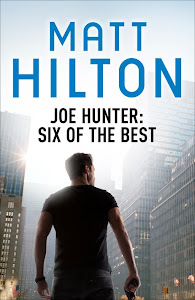 Because some readers will be coming on to Joe Hunter for the first time, I wrote an extra introductory chapter to this edition, giving new readers a taste of Joe not seen in the UK edition (Hodder and Stoughton). Here's the best news though. 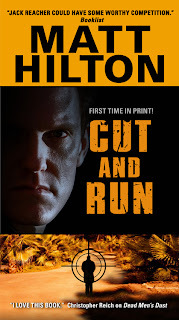 In little more than three weeks, book four, CUT and RUN, will also go on sale, hopefully adding to the buzz as both Joe Hunter and Matt Hilton's names begin to appear in heretofore unknown corners. I'm stoked about the possibilities, but also trying to remain cool, calm and collected as I also keep my fingers firmly crossed in hope that the books are a success. It's my understanding that the paperback of Judgment and Wrath (still as yet unpublished) will be out early next spring - but I guess this is down to the relative successes of SAB and CAR. Here's hoping. It sounds like I need to keep all the lights off in all the shops, so that my book continues to stand out from the crowd. Joking aside, it's great to hear that the book is out and available. I often wander round bookshops in the UK and can't find copies on sale, so this helps lighten the heart somewhat. Great stuff - good luck crackin' the US, Matt. Long overdue if you ask me.